That stunning dress was worn by a seventeen-year-old bride, Mary Dalton Norcliffe, for her marriage to Dr Charles Best in York on 11 June 1807. It’s made of Indian muslin and the V&A suggests the embroidery was done in India, too. Not only is there beautiful embroidery all round the hem and train, there is asymmetric embroidery across the front of the skirt, recalling the classical toga. 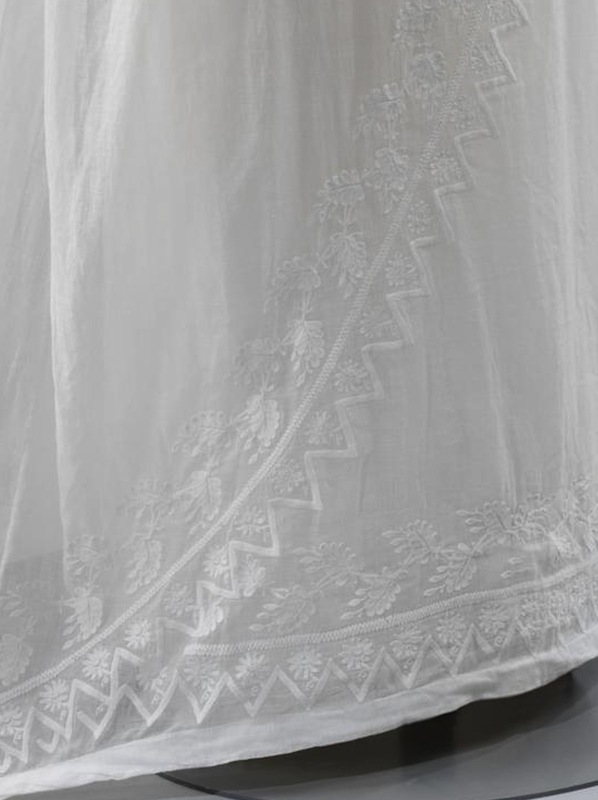 You may find it easier to see the white-on-white embroidery in the close-up, shown left. 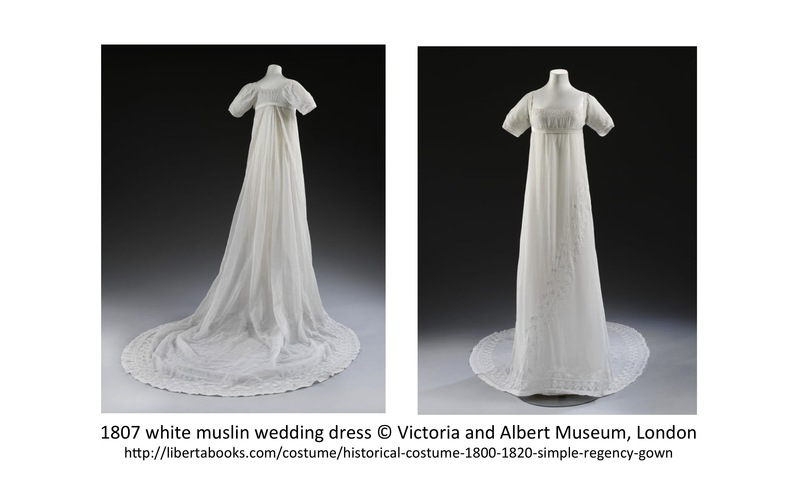 The style of Mary Norcliffe’s wedding gown seems to have been bang up-to-date; the Lady’s Monthly Museum showed similar asymmetric decoration on a formal gown about a year later. However, wedding gowns were special; not for ordinary everyday wear. So what was worn? The Regency gown for day wear was a simple style, as we know. 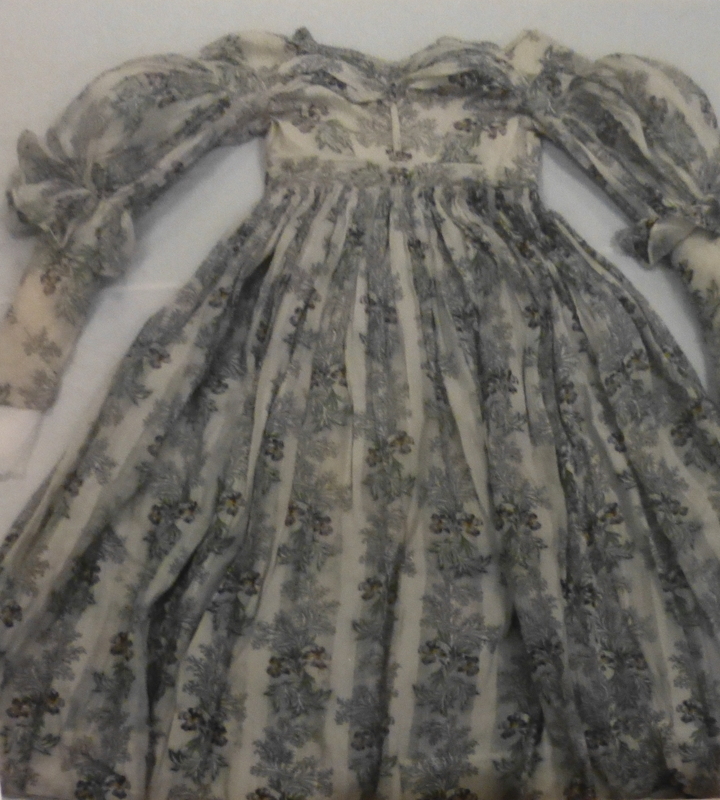 On the left is the replica, in white, of a day gown made of border-print cotton, dating from 1815. On the right is the back of the replica, showing how it was fastened with simple ties at the neck and high waist. When you see it in plain white, there really doesn’t seem to be much to it at all. The neckline is finished with a three-inch double ruffle and the shoulder and back bodice seams are piped. Can you imagine the chore of making piping by hand? Both bodice and sleeves are lined with light muslin. And that back skirt section has to be cut four times, stitched together and tightly pleated into the back bodice. So what appears to be a simple gown involved a lot of hours of work for the seamstress who was paid very little for her labours (and usually much less than the cost of the fabric). 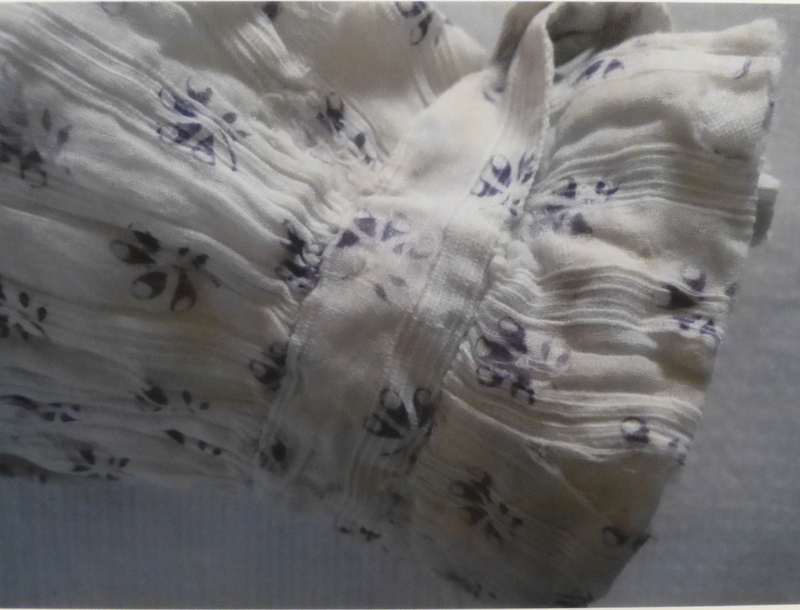 When we see the original gown, in border-print cotton, purple on white, it looks quite different and rather more special. Below is the detail of the cuff, showing the buttoned strap that creates a small ruffle effect. This close-up also allows us to see the delicate purple pattern on the cotton, possibly done by copper-plate printing. 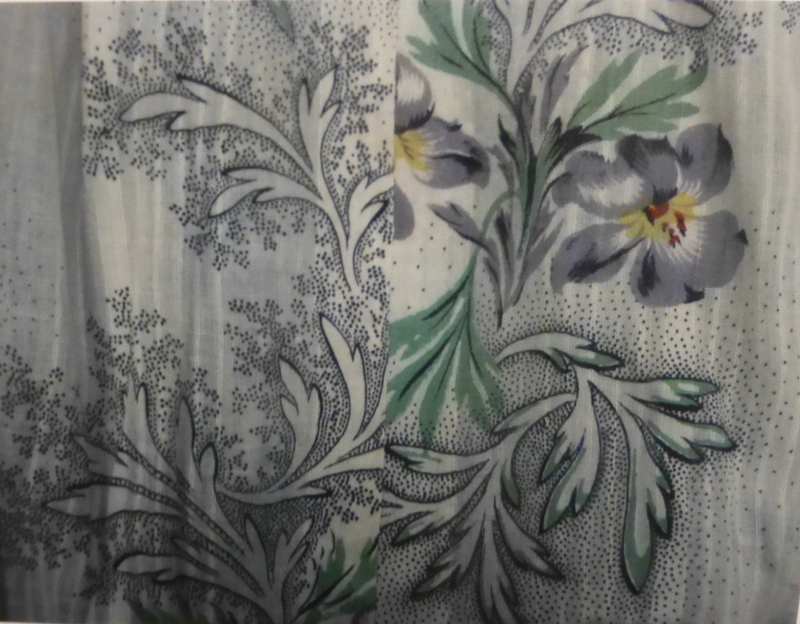 This is the hemline (left), showing the border print in all its glory. Sadly, the photo of the dress as a whole (right) doesn’t really do it justice, as we can’t see the colour contrast. It must have been a challenge to determine how much cloth to buy. Easy to work out how wide the bottom hem was, but how much extra do you allow for bodice and sleeves? 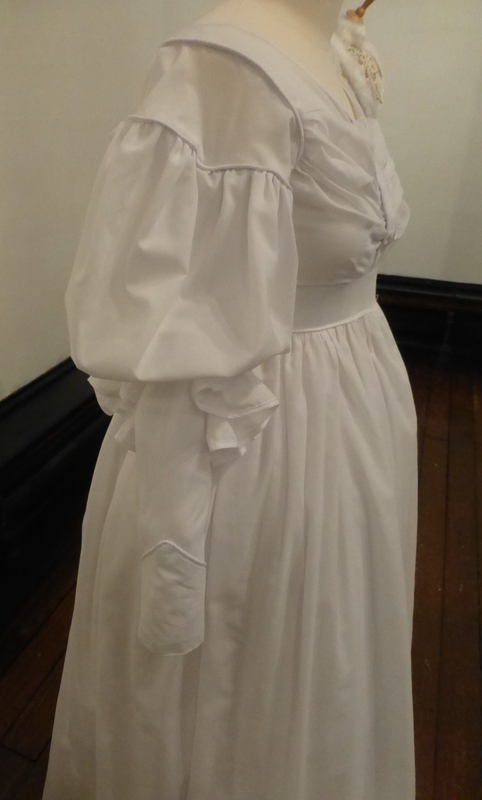 By way of contrast, I’m including a day gown from 1825. Not strictly Regency, though still in the reign of George IV, this 1825 gown shows up particularly well in the white replica version. A Regency gown tended to look simple in the 1800-1820 period, and generally had a vertical silhouette, even if it wasn’t really simple once you inspected it closely. But in the mid-1820’s, waists sank, skirts widened and much larger sleeves, including the gigot, appeared. Triangles replaced the vertical silhouette. It was impossible to say that such garments looked simple any more. On the left is the white replica, showing the intricate detail of the sleeve construction. In the centre, one of Professor Hills’ students wears the replica so that we can see how much lower the waist is, almost at the natural level. 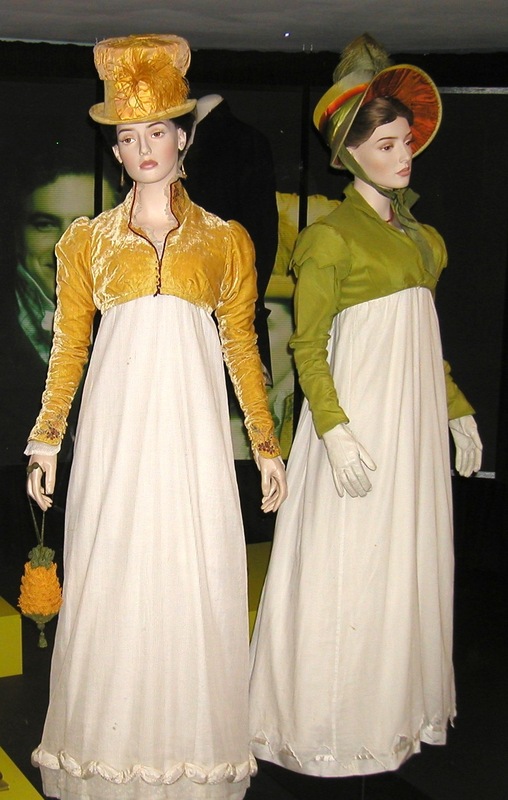 On the right is the original 1825 gown, made from cotton gauze. The original looks as if the cotton gauze is simply grey or black on a white background. Actually, it includes quite vibrant lavender and green irises, as seen in the close-up below. Delicate floral patterns on a light background — this one probably roller-printed — were becoming increasingly popular. So the mid-1820s lady could wear much more romantic styles, and colour and pattern too, if she felt like it! However, this post is about the 1800-1820 period. So, for those who enjoy seeing Regency gowns, whether original or replicas, I’m adding a few more examples. These are Regency day gowns. 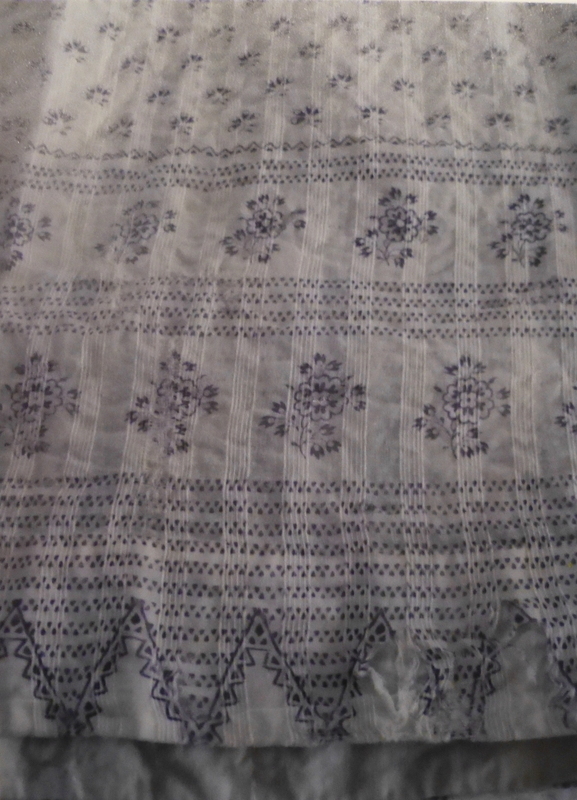 Fabrics tended to be plain and often white. 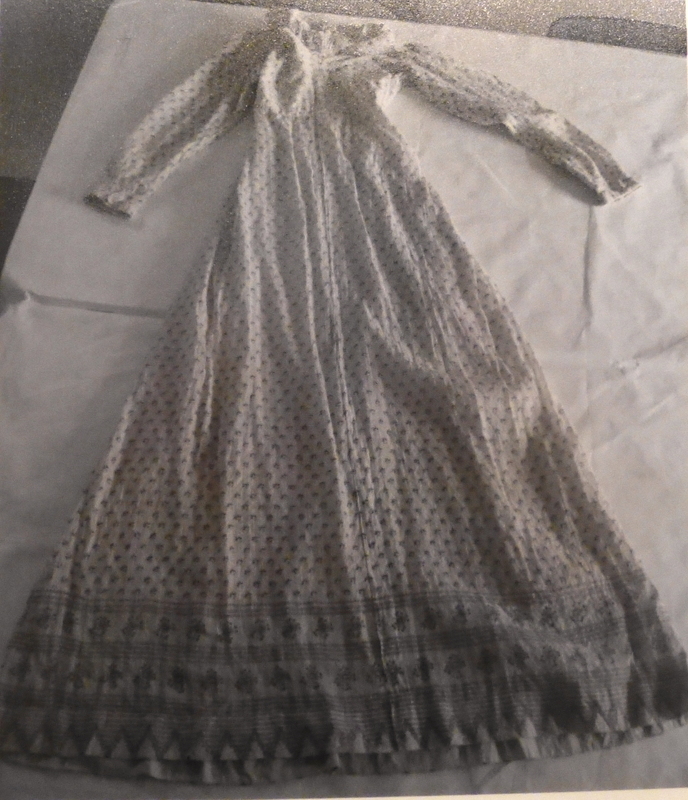 These images date from a few years ago when the Bath Costume Collection was exhibiting some of the replica gowns used in the BBC’s adaptations of Pride and Prejudice (1995) and Northanger Abbey (1987). And yes, that is Mr Darcy in the background of the first picture on the left! 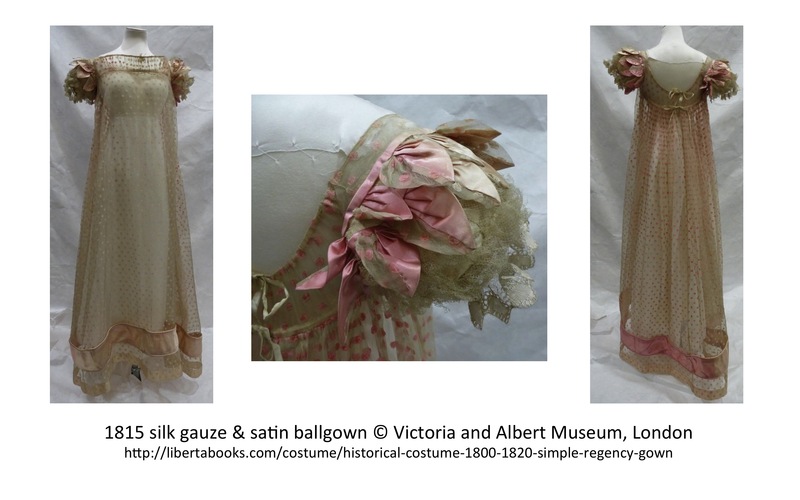 Finally, the picture below shows not a replica day gown, but a real ballgown, from the splendid collection at the Victoria and Albert Museum, London. 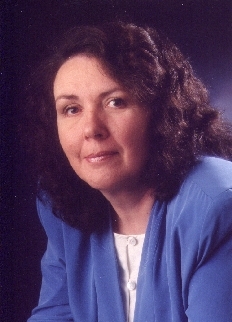 (The silk underdress is a replica.) The ballgown is dated 1815, the same as our purple-print day dress, but there’s a huge contrast both in the luxury of the fabric — patterned silk gauze with an all-over design of pink dots — and in the gorgeous styling detail. Those puffed sleeves, resembling flower cups, are a true work of the seamstress’s art. 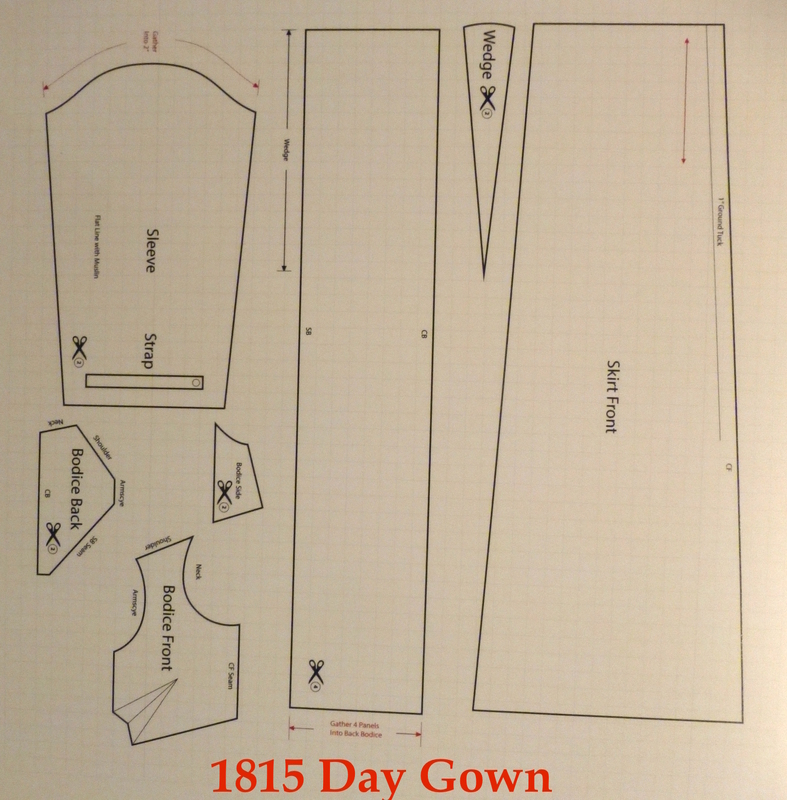 Possibly the simple Regency gown is not so simple after all? Goodness. that 1825 dress looks fussy by comparison. But definitely neither period’s style designed to flatter the short and plump. Sigh. I noticed that the student chosen to model the dress was decidedly willowy. Sighing in sympathy. Lovely gowns. Yes, Rowlandson’s sketches show how little the Regency style favoured the small and plump, but a bosomy figure must have done extremely well in them. Great blog. Thanks, Liz. I’d forgotten about those cartoons. You’re so right.